A World War II wreck in the Thames Estuary packed with explosives is a timebomb waiting to go off, a report has claimed. The American cargo ship USS Richard Montgomery, 2km off Sheerness in Kent, has 13,700 explosive devices on board. If the ship exploded it would be one of the biggest non-nuclear blasts ever and would devastate the port, the report in the New Scientist magazine claims. The Department of Transport said a risk assessment of the ship was in progress. The government commissioned the assessment in 1999, but it has not been published. Mick Hamer, who wrote the report for New Scientist, told the BBC he felt there were two main options - to bury the wreck in sand or concrete or to move all or part of it. But he said if the ship or its cargo was moved the whole of Sheerness would have to be evacuated because of the risk of explosion. He said: "It's as dangerous now as it has been for the last 60 years. "There's 1,400 tonnes of TNT on there, that's about one twelfth the size of the atomic bombs dropped on Japan. "It could blow up for a number of reasons - it could blow up spontaneously, it could blow up in parts or it could blow up the whole cargo. "It could blow up because of terrorism, somebody might target it, or it could blow up simply because of bombs moving in the tide." The Department of Transport told BBC News Online the wreck of the USS Richard Montgomery was checked by divers once a year and that no ships were allowed to pass over the wreck. She said the last examination, in 2003, showed the site to be no more dangerous than in the past. The ship ran aground in 1944 and a salvage operation was deemed too risky to continue. When the wreck was reassessed the bombs were considered too unstable to move. In 1970, government tests on the site showed a blast would hurl a 1,000ft wide column of water, mud, metal and munitions almost 10,000ft into the air. 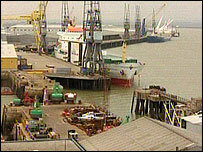 The shock of the blast would shatter almost every window in Sheerness and damage buildings. The explosion would also generate a 16ft high wave that could sink a small craft. Mr Hamer said: "It's certainly going to be very dangerous to do anything about it, there's no doubt about that. "The government has been advised that doing nothing isn't really a sensible option any more." A spokeswoman for the Department of Transport said: "The site remains a prohibited area under the Protection of Wrecks Act 1973 - no vehicles can move over the site. "An ultrasound in 2003 showed no grounds for increased cause for alarm and we keep the condition of the vessel under regular monitoring."